The SIG60 power line transceiver is capable to transfer any number of UART protocol bytes over the DC power lines at bit rates up to 115.2 Kbit/s. The IC operates both as a master or as a slave in a network of multiple SIG60 and SIG61 devices. The SIG60 IC device communicate over DC battery power line using UART protocol bytes at bit rates up to 115.2 Kbit/s. The device simply interfaces with any UART / LIN port of any micro controller (ECU). The power-line is used for both power and data communication, thus eliminating the need for special wires for carrying control or data. The SIG60 uses a unique multiplex digital signaling technology that overcomes the power line noisy environment. The small footprint integrates most of the analog components needed for its operation. A capacitor interfaces the SIG60 signals to the power line. The device has a sleep mode for power saving, where its power line sensing allow wakeup from messages imitated by other devices. The SIG60 device can interface directly to a LIN host, hence eliminating the LIN transceiver. The SIG60 can reach bit rates of up to 115.2Kbps allowing to increase the LIN bus bit rate of up to 5 times faster than a traditional LIN network. 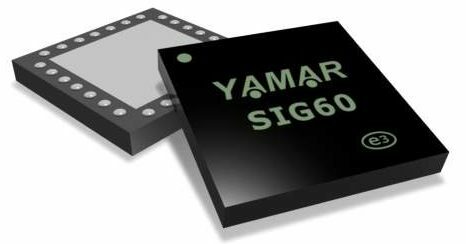 The SIG60 is byte oriented IC device. Each byte that is entered to the device is modulated by a unique signaling modem and conducted via capacitor over the power line. At the receive side, the byte is decoded and output to the external host after a fixed delay of 3.5 bits. any number of bytes can be transferred. It allows the user to define its own message protocol. Robust UART / LIN communication over the power lines. UART bit rates between 9.6 Kbps to 115.2 Kbps. Operates as Master or Slave in multiplex network. Multiple networks may operate over the same power line. Eliminates the UART / LIN bus wires and transceiver. Small size 28 pin QFN package. Avionics sensors - actuators bus. Transmit UART or LIN over the power line. Vehicle body control - doors, seats, mirrors, A/C, lights etc.